Ambience: the sonic environment in which an event takes place. Also referred to as ambi. When it comes time to record ambience in the field, it’s important to capture different perspectives. It helps to think about these perspectives similarly to how you would think about photography. Here are the five approaches you should take. Stand back and get a very generic feel for the scene. As obvious as this may sound, there is a tendency for people to forget this part. Move closer in, almost as if you’re standing in the middle of the scene. Get close to specific sounds that punctuate and enhance the scene. These should be moments that are identifiable, like a cash register, a bell, a door, a train, the conductor or people chattering. You won’t expect the surprising moment, but you need to keep your eyes and ears open. This could turn out to be the most important thing you record. Record a few minutes for each of these. Don’t settle for 30 seconds. 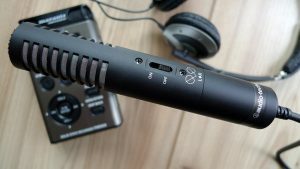 You’ll need to edit out superfluous sounds and mic handling noise. So make sure you record more than you think you’ll need. Otherwise, you could be left with very little in the end. If possible, allow for a second or two of clean ambience before you start a question to an interviewee. Same for rolling tape at the end of answers – but again, only if possible. Mic yourself. You never know when you’ll use your question. Cindy Carpien is a former NPR producer.